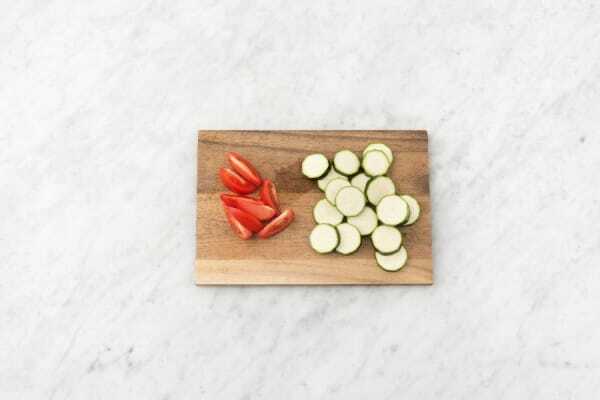 Although this recipe’s zucchini and tomato medley is a side, it takes center stage in our eyes. It’s equally as creamy as it is crispy, and the combination of panko, mozzarella, and Parmesan cheese is to thank for that. 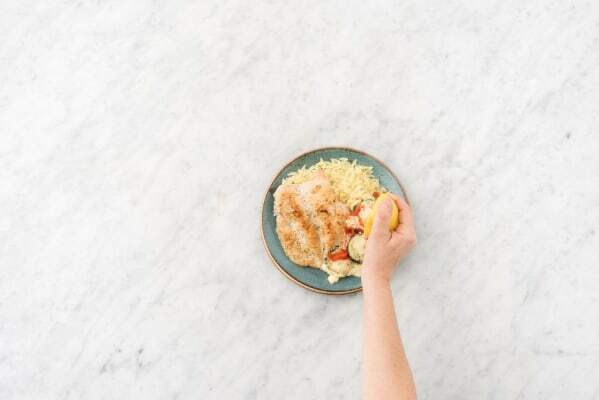 With the addition of an herbed chicken breast and lemony orzo, this is a light meal that hardly lacks in flavor. Wash and dry all produce. Preheat oven to 425 degrees. Bring a large pot of salted water to a boil. Slice zucchini into ¼-inch-thick rounds. Cut tomato into wedges. 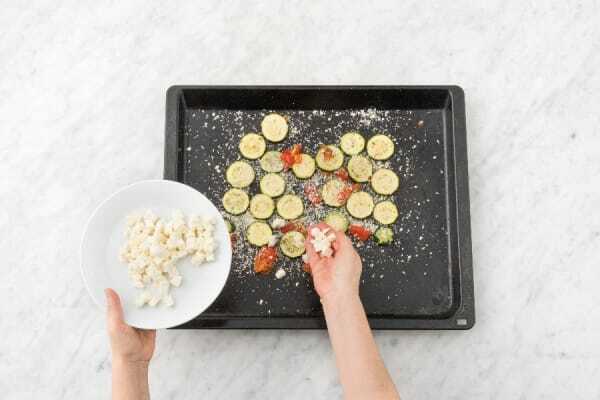 Toss zucchini and tomato with 1 TBSP olive oil and half the Italian seasoning on a baking sheet. Season with salt and pepper. Roast veggies until just shy of tender, about 10 minutes (we’ll be adding more items to the sheet later). 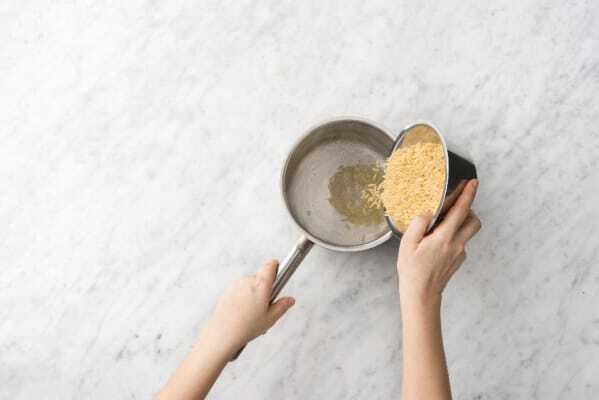 Once water is boiling, add half the orzo to pot (save the rest for another use). Cook, stirring occasionally, until al dente, 9-11 minutes. Drain, then return to pot. 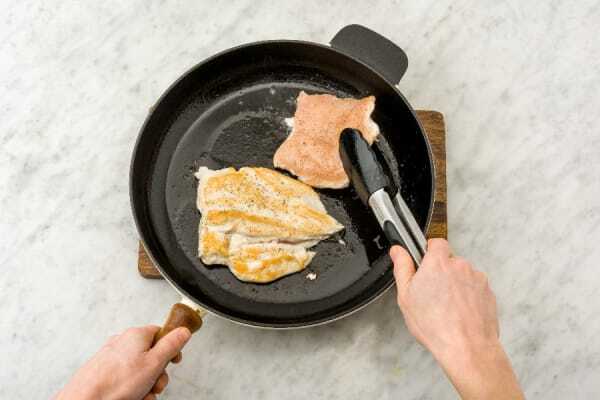 With your hand on top of one chicken breast, cut ¾ of the way, parallel to cutting board, stopping before you slice through completely. Open it up and season all over with salt, pepper, and remaining Italian seasoning. Repeat with other chicken breast. Once veggies have roasted 10 minutes, remove baking sheet from oven. Heat broiler to high or increase oven to 500 degrees. Sprinkle veggies with panko, mozzarella, and Parmesan. Broil (or bake) until panko is golden brown, cheese is melted, and veggies are tender, 3-5 minutes. Add juice from one lemon half and half the parsley to pot with orzo and toss to combine. Season to taste with salt and pepper. 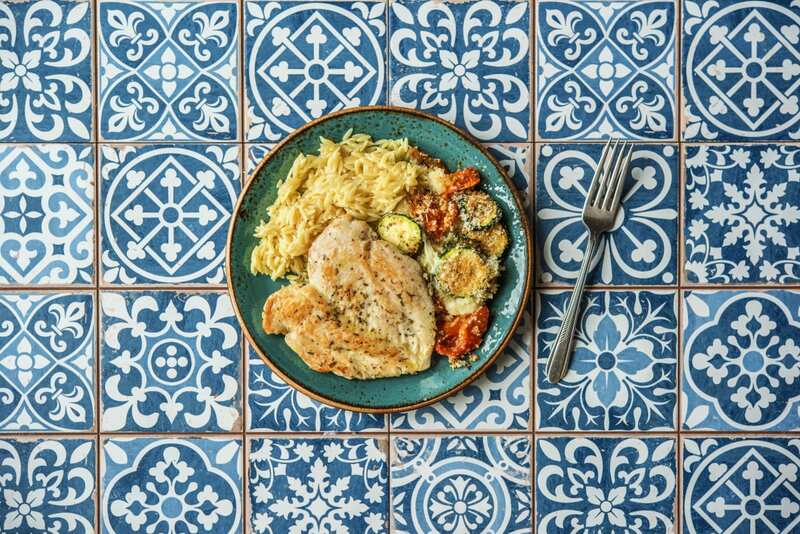 Divide orzo between plates. Top with veggies and chicken. Drizzle with any chicken juices from plate and a squeeze of remaining lemon half. Garnish with remaining parsley.